These Primark jeans were screaming out at me when I first spotted them. I'm not even sure why - the print isn't fantastic. I'm not a fan of tigers. They fit like a dream though, and are slightly ankle grazing (although that could just be due to my height). 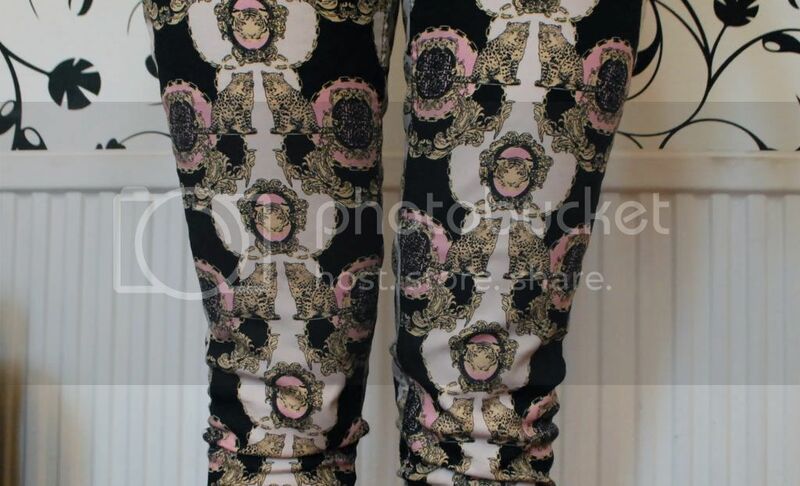 I do like the idea of patterned jeans, and I think these will grow on me in time. As for the Reiss vest, did any of you get the freebie in the recent ELLE magazine? I know they can't really do it by size, but surely they'd know not to make it so you would flash everything to the world if you didn't wear a top underneath? I don't really like layering vests, but I definitely need to for this. It'll come in handy one day though, I'm sure. Currently going through a bit of a blogging 'can't-really-be-bothered' frame of mind at the moment. I'm now sat down at my desk, determined to get a few blog posts done so I don't have to worry about blogging during the week, and hopefully will help me miss my blog and get back into it next week! Whether that'll work, I don't know. I love blogging, but I think I've just gone a bit lazy with it. Off to see my best friend for lunch today... This weekend has been no match to last weekend (in Holland) at all. I hate boring weekends. A good catch up and some advice from Jess will do me some good though. She never fails to talk sense into me!